Scientists will always tinker. 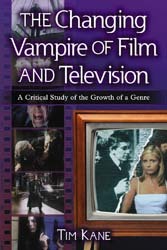 While they mostly seek to improve the world, some scientists stray into Frankenstein category. Now that the genome has been hacked open, also sorts of possibilities pop up, from the useful to the ridiculous. Say you often can’t find your cat when she wanders around the house at night. Problem solved. Get a glow in the dark cat. Yes, it’s true. 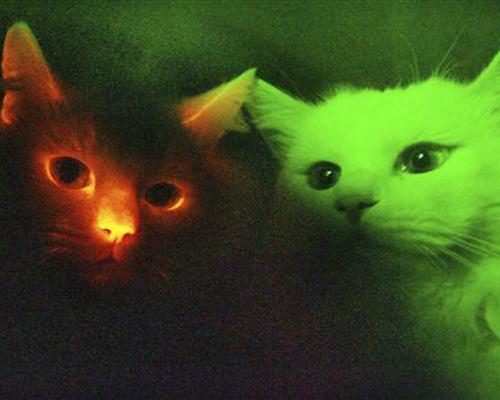 South Korean scientists meshed a cat’s DNA with a red fluorescent protein. Why did they want glowing kitties? Just because. Although some of the genetic engineering works around possibility for science’s sake. Not everyone needs a glowing cat. But what about a dinosaur? Look at a modified Umbuku Lizard. Those wings aren’t glued on. They were dormant in the lizard’s genes. A little tinkering brought them out. 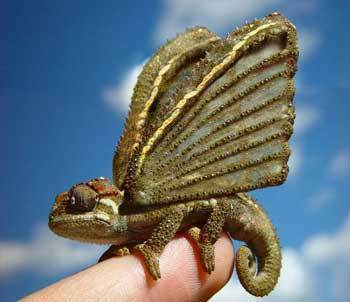 Scientists believe that this lizard is a descendent of the Pterodactyl, which lost its ability to fly some millions of years ago. To date only 6 of these flying Umbuku have been produced and they are kept seperate from the natural Umbuku due the risk of cross breeding. Some genetic tinkering can produce results we can all use. Consider the fact that nearly all paper comes from wood pulp. However, you have to kill the tree to make the paper. What if you didn’t? Trees produce leaves every season. A Swiss-based company saw the possibilities. They engineered a tree whose leaves look like sheets of paper. That’s right. Just pluck a sheet and get writing. Bonus, the tree lives. Up to this point, scientists have combined like items (plant with plant or animal with animal). 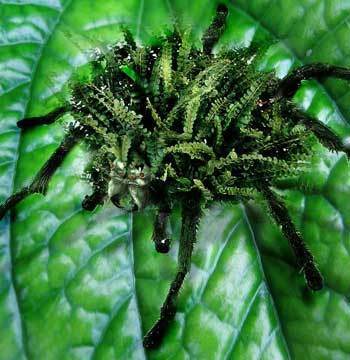 Here comes the fern spider. This is one of the first animal/plant hybrids. The Italian Wolf spider (Lycosa tarantula) was crossed with a ponga fern (Cyathea dealbata) to test the survival rates of creatures with camouflage. 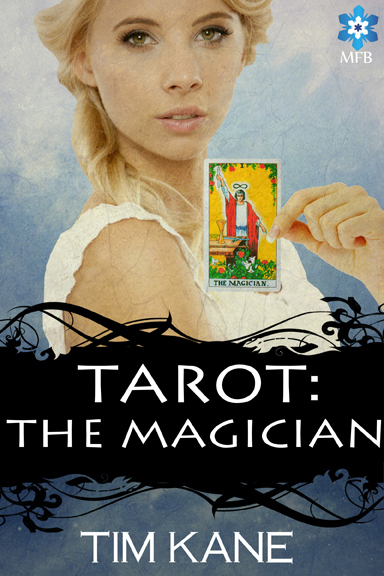 Finally, this tinkering can be simply for the purpose of beauty. 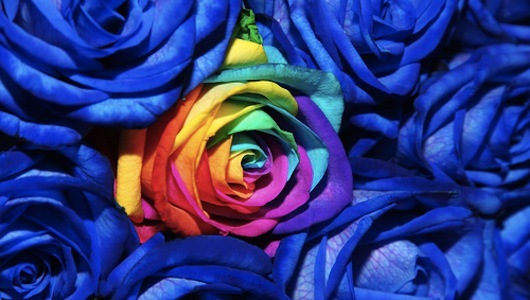 The Japanese company, Suntory, managed to create a blue rose called “Applause.” Blue roses don’t exist in nature. Many horticulturalists strive for this coveted goal. The company mixed rose genes (Old Garden ‘Cardinal de Richelieu’) with a delphinidin-producing gene from a pansy. The future certainly looks strange. 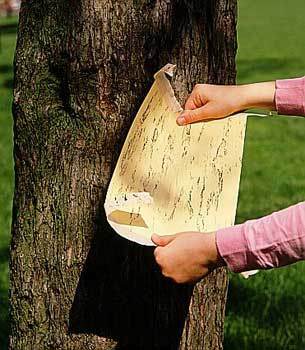 I don’t know how I’ll use my glowing cat, but at least I can pull a sheet of paper from my tree. Alas, if only it grew money. This entry was posted in Weirdness and tagged cat, engineer, genetic, spider, tree. I certainly agree with you about the money tree! As for glow-in-the-dark cats, well, I think scientists really have gone too far – like Sheldon from The Big Bang Theory who bred fish with glow-in-the-dark tendencies so he’d have a night light! If the scientists who bred the Umbuku lizard are afraid of cross-breeding, why did they create the thing in the first place? Answer: because they could, I guess. That fern spider is creepy. I wouldn’t want to find the thing in my salad by accident. Blech! I’m not sure any of this kind of tampering can be useful, unless it’s to help doctors repair amputated limbs or some such thing. Then again, there’s that movie, The Island, where clones were created to provide spare parts for people who could afford the process. How ethical is that? I really wonder where all this will lead and it scares me a little. It is the future and it’s questions like this that help us get there with some shred of morality. You guys do know these are all an April Fools joke. scientists need 2 chill out with this. i think we all know that they probably used many more cats.